Once per turn, Diao Chan can discard one heart to make a male do a judgment. If it is a heart, she can control him to do one action. If it is not a heart, she hurts the male one. At the end of her turn, Diao Chan can select any heart that she used or discarded during her turn, and put it in her hand. 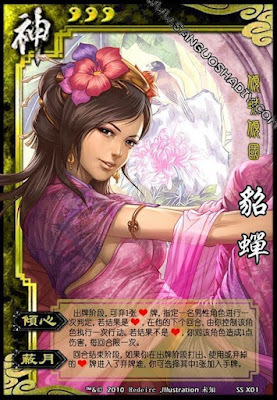 Diao Chan can force the male to play any card on any player. She gives the male her order after his drawing phase. If he cannot do the requested action, he must prove it by showing her his hand. If the male can do it, he must perform the action.